Inscribed on the temple of Apollo at Delphi is an ancient saying attributed to the Greek philosopher Socrates, "Know Thyself". He knew that wisdom came from not only self-awareness, but self knowledge. This journey to understanding self can take a lifetime of exploration. Assessments, when interpreted by a well-trained coach, can provide objective, third-party platform that can provide valuable insights into different aspects of personality. We are constantly in search of the most effective assessment tools for our clients to accelerate their self development. Do you have the opportunity to do what you do best every day? Chances are, you don't. All too often, our natural talents go untapped. From the cradle to the cubicle, we devote more time to fixing our shortcomings than to developing our strengths. ​One of our favorite assessments is the Gallup StrengthsFinder assessment. 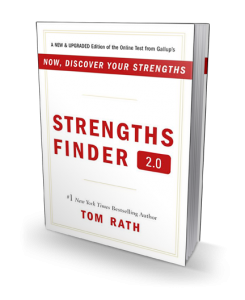 Found in the books, Now, Discover Your Strengths, and StrengthsFinder 2.0, a 20-minute online assessment that reveals your top talent indicators in order. While you can read this book in one sitting, you'll use it as a reference for decades. As Gallup Certified Strengths Advisors we incorporate this wonderful assessment in our coaching and training programs and invite you to take the assessment and schedule a session to see how Spiraling Up Your Strengths can make you an even more effective entrepreneur and leader in your own life. Click video below to understand the importance of capitalizing on your strengths. Would you like to learn more about the science behind strengths? Listen to this 3-minute overview of the strengths movement and why you should be part of it. The Gallup StrengthsFinder assessment is a valuable tool in understanding your top 5 talent indicators, but often the exam is not enough to make a transformational difference in your life without proper context. ​At Spiraling Up Solutions, we help you to truly understand your strengths and how to create strengths-based teams and partnerships. We will teach you how to "Spiral Up" your strengths to help to get you from where you are, to where you want to be.